Every time The Flash moves 4 units, he will receive one stack of speed force. Upon reaching 10 stacks, The Flash will activate the speed force, strengthening his next normal attack while dashing forward. He also temporarily reduces his target’s movement speed by 50% and deals (+1.0 AP)ˀ magic damage. When he hits his target, he gains a shield of 350 (+0.5 AP). After a short charge up, The Flash dashes forward, dealing 200/220/240/260/280/300 (+0.4 AP) magic damage to all enemies in his path. The Flash cannot be controlled while dashing and can cancel the dash by using another ability. 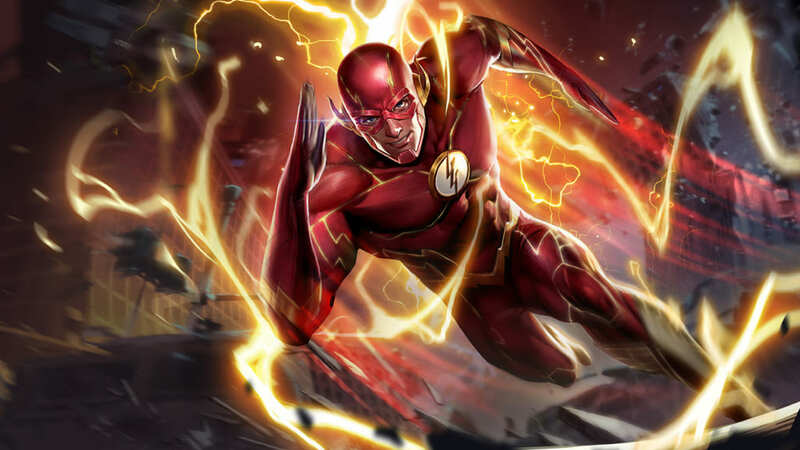 When The Flash reaches his destination, he can activate the skill again to return to where he started, dealing 200/220/240/260/280/300 (+0.4 AP) magic damage. Enemies damaged by the initial dash are dealt an additional 300/360/420/480/540/600 (+0.75 AP) magic damage. The first dash can be interrupted. Despite only traveling 1500 units, The Flash will gain 5 stacks of Sonicboom with each usage of the ability. The Flash channels the speed force and punches an enemy 5 times within 0.8 seconds, dealing 135/160/185/210/235/260 (+0.2 AP) magic damage every time. The last punch deals double damage and, when it hits an enemy, grants The Flash a 40% movement speed increase that weakens over 2 seconds. The Flash takes off in a circle and creates a cyclone, dealing 90/130/170 (+0.12 AP) magic damage to surrounding enemies for 2 seconds. While he is generating the cyclone, The Flash cannot be targeted by abilities and can move the cyclone’s position at 40% of his movement speed. 2 seconds later when The Flash stops, the vacuum from the cyclone pulls in surrounding enemies, dealing 500/750/1000 (+0.7 AP) magic damage. The Flash deals additional damage when both dashes of the super Speed hit, so you can do some serious damage if you plan ahead and time it right with Sonicboom. See all of The Flash’s item builds.